We didn’t expect the 30th Anniversary Edition Miata to be orange, but Mazda explained it chose the color for a good reason. Called racing orange, the hue was created specifically for the commemorative model. 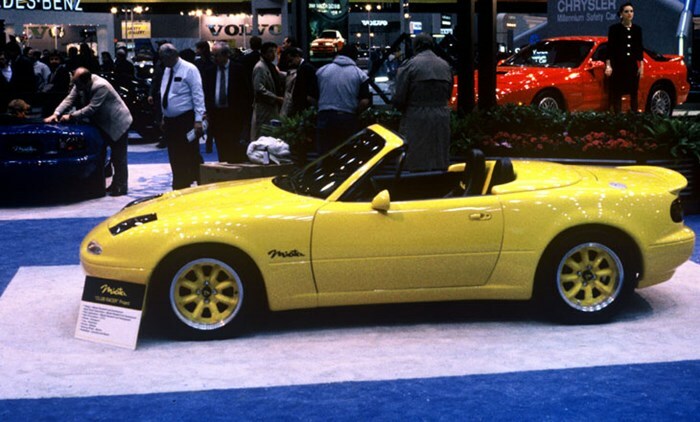 It’s a tribute to the yellow, track-ready MX-5 Miata Club Racer displayed alongside the production car at the 1989 Chicago show. “Rather than simply reusing this color, this new orange evokes sunrise and anticipation to celebrate the future of MX-5,” the company explained. Racing orange isn’t available on any other 2019 Miata, so the 30th Anniversary Edition model stands out from the pack right away. It also receives black forged aluminum wheels, brake calipers painted orange to match the body, and a numbered plaque above the driver-side rocker panel. Inside, Mazda added Recaro bucket seats with orange contrast stitching and piping, and a Bose sound system that somehow crams nine speakers into the Miata’s tight cabin. Mazda hasn’t made any mechanical changes to the 30th Anniversary Edition. Like the standard Miata, it’s powered by a 2.0-liter four-cylinder engine tuned to deliver 181 horsepower and 151 pound-feet of torque. Rear-wheel drive and a six-speed manual transmission come standard, and buyers who would rather not shift their own gears can select a six-speed automatic gearbox at an extra cost. Cars equipped with a manual transmission gain a sportier suspension that improves handling. That’s an incentive — should you need one — to go with three pedals. 30th Anniversary Edition production is limited to 3,000 examples worldwide, and only 500 of those will head to the United States. The package can be applied to the both the regular model model with a cloth soft top and the RF model with a power-retractable hard top. Pricing starts at $34,995 for the soft top and $37,595 for the hard top, and the first deliveries are scheduled for June 2019, but we have bad news to share if you want one: It’s too late. Every U.S.-spec car was spoken for online in a matter of hours. There’s no indication that Mazda will increase production, but it’s giving enthusiasts the chance to add their name to a waiting list in case some of the early reservation holders decide to cancel their order.